So if you’ve been following along my path to simplicity, you know I bake bread. It’s true that handsome RancherMan of mine is a certified bread-a-holic. He loves bread in all its forms that’s for sure. But he loves my homemade bread the most. 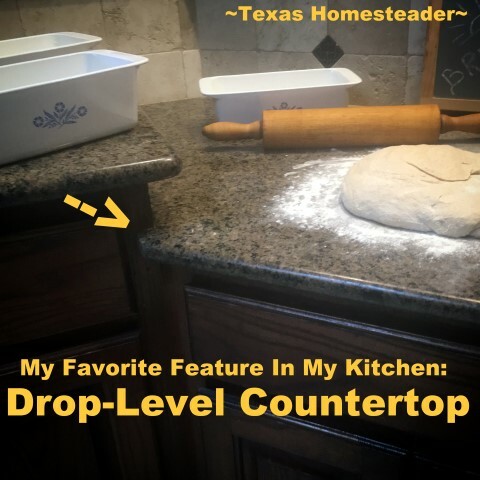 Since I’m always making bread, my favorite feature in my homestead kitchen is this little section of countertop. It’s purposely dropped to a lower level to make my bread-making easier. Now RancherMan’s always loved his bread, even long before we ended up here in our little piece of Texas paradise. Back when we lived in the ‘big city’ I’d make him homemade bread too of course. But the kneading always frustrated me. You see, a typical countertop is approximately 36″ high. But that’s an uncomfortable height for me to knead bread, even though I’m considered tall at 5′-9″. When it was time to knead the dough I’d either end up standing on my tippy toes or bringing a short footstool to stand on to be able to properly lean over the dough to knead. That would help assure the long knead time wouldn’t be so tiresome on my arms. If all else failed I’d move the dough to the kitchen table. It was a much more comfortable height to knead there. But the pushing of the dough also made the table move around since it obviously wasn’t affixed to the floor. So it wasn’t an ideal solution either. So when we moved to our beloved homestead, RancherMan had a small section of my kitchen countertop built only 32″ high. This means when I’m kneading the dough I’m able to easily lean into the counter when I’m kneading, pressing & folding the dough. Thank you RancherMan for making sure my kitchen is best suited for my needs. I’ll reward you with homemade bread as often as I can possibly make it! Do you have a favorite feature in your kitchen? 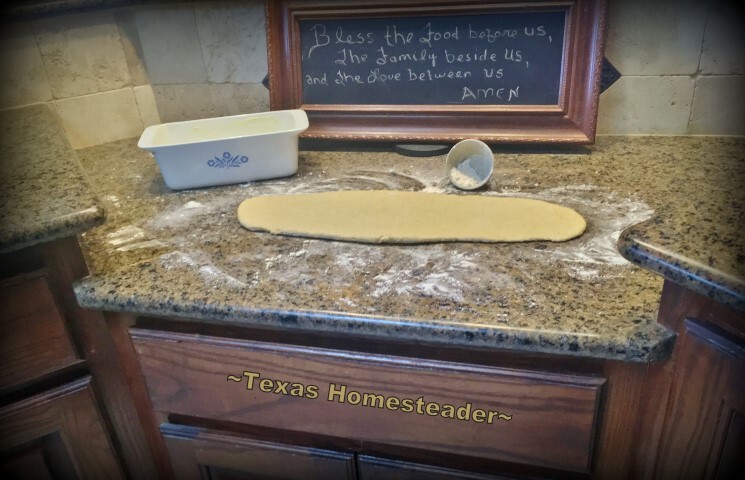 This entry was posted in Blog Posts and tagged Cooking on January 20, 2019 by Texas Homesteader.